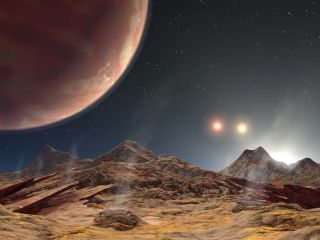 An artist's illustration of exoplanet in a triple-star system. Luke Skywalker's backstory may not be so fanciful after all. Some alien planets in multiple-star systems — such as the two-sun Tatooine, Luke's home world in the "Star Wars" universe — may indeed nestle in orbits that are stable for long stretches of time, a new study suggests. Now, the stable-orbits proponents have some more evidence to cite. "We ran the simulations for periods ranging from 1 million to 10 million years, in order to see if the systems are stable over very long periods," study lead author Franco Busetti, of the School of Computer Science and Applied Mathematics at the University of the Witwatersrand in South Africa, said in a statement. "The analysis shows that most configurations had large enough stable regions for planets to exist," added Busetti, who presented the results Monday (June 4) at the 232nd meeting of the American Astronomical Society in Denver. "Many of these areas are actually very habitable for planets." Fewer than 40 three-star planets are known. But the new study, which has been submitted to the journal Astronomy & Astrophysics, could help astronomers find more, Busetti said. "It could assist in selecting suitable candidates for a survey of such systems and guide the observational searches for them," he said. "The geometry of the stable zone indicates not only where to look for planets but how to look." For example, NASA's Transiting Exoplanet Survey Satellite, which launched in mid-April to hunt for worlds circling stars in the sun's neighborhood, is expected to exceed Kepler's tally eventually. And Europe's star-mapping Gaia spacecraft will likely spot thousands of exoplanets as well, European Space Agency officials have said.